Good morning. It's Monday, Oct. 15. • Bracing for the first major fire warnings of the fall season. • "Mad Max" fans recreate a dystopian world in the desert. • And State of Jefferson supporters push the separatist cause. 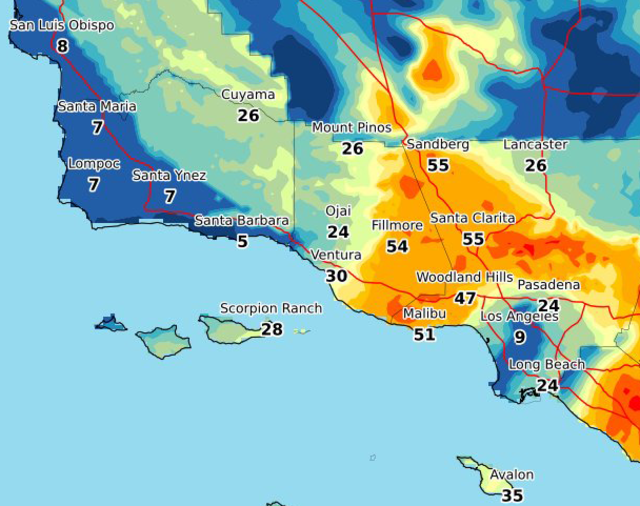 A map showed expected wind speeds in m.p.h. for Monday morning in Southern California. Bone-dry weather and strong winds prompted Pacific Gas & Electric to preemptively shut off electricity to about 87,000 customers across parts of Northern California late Sunday. California officials were bracing on Monday for the first major fire warnings of the fall season. Shutoffs were possible for up to 217,000 PG&E customers, the L.A. Times reported, including southern reaches of the state where forecasts called for gusts of up to 75 m.p.h. Read more at the L.A. Times and S.F. Chronicle. 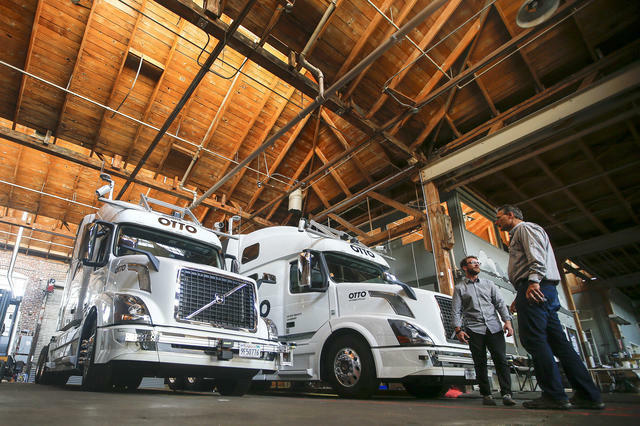 Self-driving trucks in San Francisco. Economists say it's just a matter of time before automation steamrolls over millions of jobs. Bookkeepers, accountants, and cashiers are expected to be among the most susceptible. It's a problem that doesn't get talked about enough, but it's one that California's next governor won't be able to avoid. Marijuana is emerging among the vineyards of the Santa Ynez Valley. 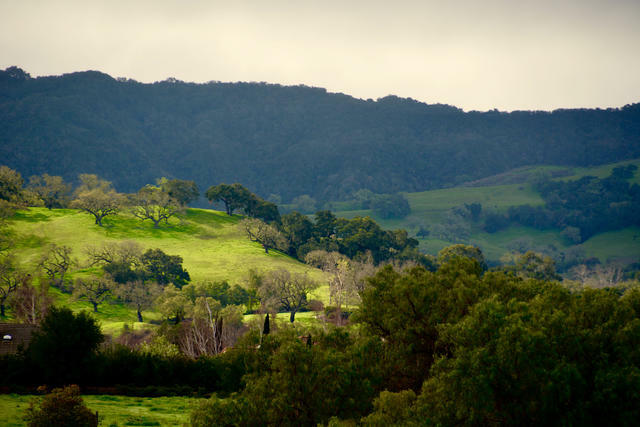 No place has attracted more interest in cannabis cultivation than California's Central Coast. If trends hold, the region could be on track to grow more marijuana than the fabled Emerald Triangle. "Pretending it will go away on its own is fantasyland," said a Santa Barbara County official who opposed legalization. "But I’ll be the first to say I hope it doesn’t get too big." The war of words between Russia and the U.S. hasn't prevented Calpers — which oversees retirement funds for firefighters, cops, and other public workers — from investing $460 million in bonds sold by President Putin’s government. The holdings pose a dilemma for U.S. lawmakers who are considering targeting Russia’s sovereign debt with new penalties over election meddling. Blackstone Group, a private equity giant that is also the world’s largest real estate management firm, has pumped nearly $7 million into the battle against a ballot measure in California that would allow cities to re-establish rent control laws. Blackstone has more than 12,700 single-family homes in California that are currently ineligible for rent control. Everyone is expected to be in costume at Wasteland Weekend. "The strangest desert festival in the world." Each year, people draped in chains, spikes, and gas masks gather in the Mojave Desert to recreate the dystopian world of "Mad Max." There's even a Thunderdome, where combatants face off every night. 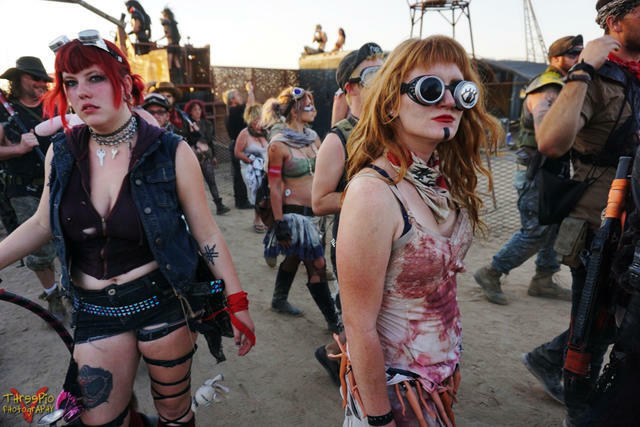 Wasteland Weekend dates back to 2009 when a group of about 150 "Mad Max" fans decided to take a camping trip. This year, the event drew about 4,100 people. 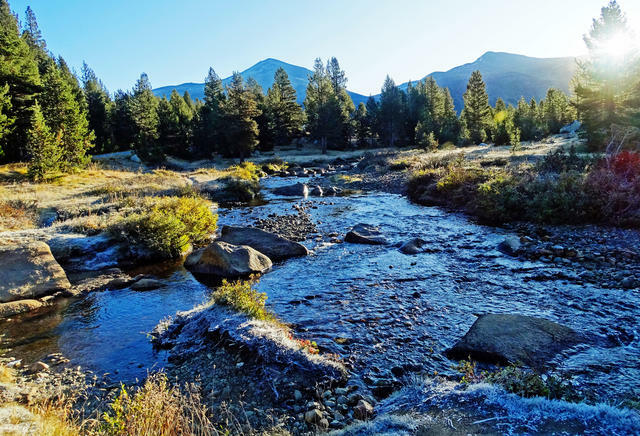 The Tuolumne River averages just 21 percent of its historic flow at peak runoff. Relentless water diversion has caused rivers from the Sierra Nevada to shrivel, sparking a crisis for fish, wildlife, and people who rely on the California delta. Now, a plan to restore the waterways faces an unlikely foe: progressive San Francisco. At least one county official is conflicted. "This is a city that prides itself on its environmental record," he said, "and we should be part of the solution." In Silicon Valley, the rich are getting richer and the poor are getting poorer. Nine out of 10 workers in the region make less than they did in 1997 after adjusting for inflation, according to a new report. The researchers said company profits are increasingly concentrated among a select few — largely high-skilled tech workers. Urmila Mahadev spent eight years in graduate school at U.C. Berkeley solving one of the most fundamental problems in quantum computing: How do you know whether a quantum computer has done anything quantum at all? The monumental work has established her as one of the rising stars of theoretical computer science. 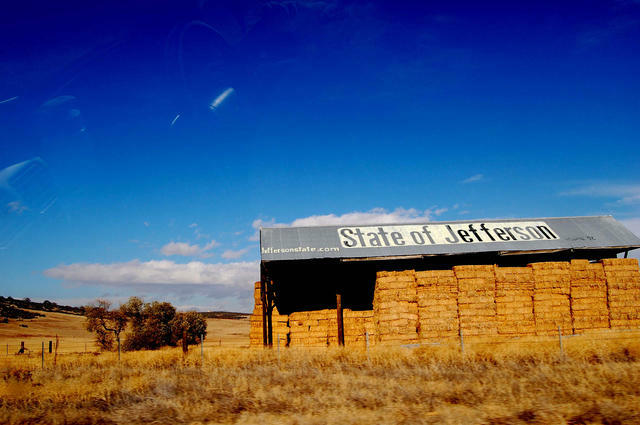 The movement for a State of Jefferson remains a hot issue in the North state. The State of Jefferson movement never died. The Northern California rebellion got its start in 1941 when a group of miners halted traffic in Siskiyou County and declared a new state named after the author of the Declaration of Independence. More recently, Jefferson proponents are pushing their separatist cause through the courts — with little success. The Record Searchlight has the story along with a photo gallery. Hundreds of students, some as young as 8, left their Beverly Hills classrooms to protest a plan to tunnel beneath Beverly Hills High School as part of a subway extension. Critics say the project poses a danger to children's safety. In an editorial, the L.A. Times cited "study after study" showing that is not the case. "Seriously, Beverly Hills?" it wrote. "Cut your Purple Line hysteria, already." Rep. Kevin McCarthy, a Republican from Bakersfield, is one of the most powerful elected officials in California and on the national stage. 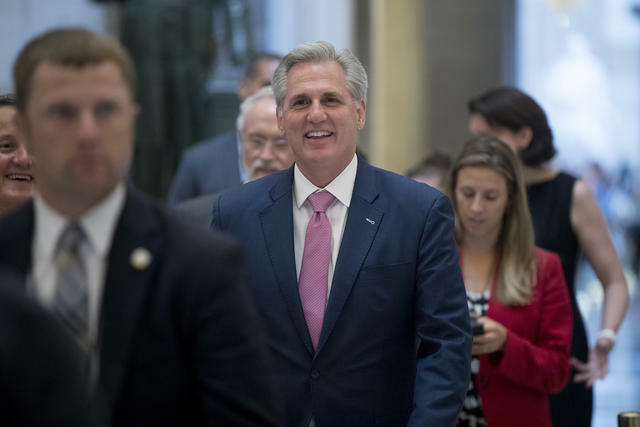 A company principally owned by Rep. Kevin McCarthy's brother-in-law has won more than $7 million in federal contracts at U.S. military installations and other properties in California, an L.A. Times investigation found. The contracts, intended to go to disadvantaged minorities, were doled out based on the claim that he is a one-eighth Cherokee Indian. But an examination of records cast doubt on the claim. Meet Susie Bean Breitbart, the quiet powerbroker behind Breitbart. According to friends, Breitbart is the quintessential Westside L.A. mother, whose lifestyle just happens to be funded by the fire-breathing empire founded by her late husband, Andrew Breitbart. 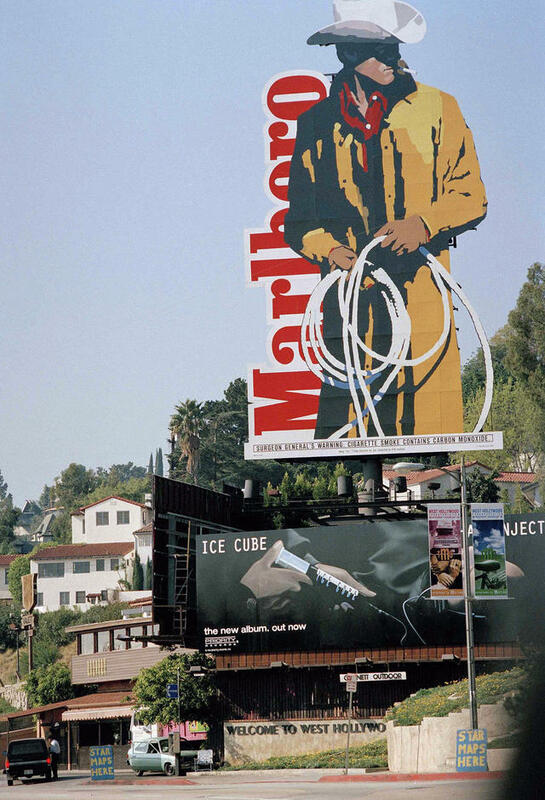 The Marlboro Man overlooked Sunset Boulevard in 1994. Since the 1960s, Los Angeles’s Sunset Strip has hosted a kaleidoscope of custom-built billboards. They've been labeled variously as "sky trash" and art. An architecture critic once called a 70-foot Marlboro Man "one of the most effective landmarks in the confusing landscape of our city." Timeline put together a photographic field trip to the Sunset Strip's last 50 years of billboard advertising. Sunken City is an urban ruin in San Pedro. One of the most popular attractions along the Los Angeles waterfront is officially off-limits. But that hasn't stopped people from making daily pilgrimages to the so-called Sunken City of San Pedro. 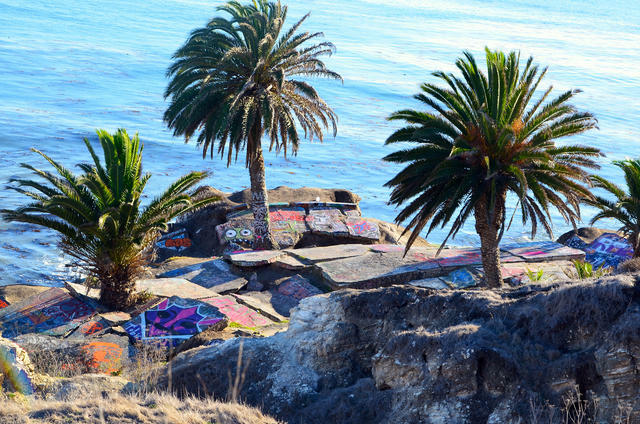 The clifftop jumble of palm trees and colorful slabs are what's left of a community built in the 1920s that was abandoned after it began sliding into the Pacific. Over the years, the site's post-apocalyptic vibe made it popular with teenagers and other curiosity seekers. (Here's some drone footage). Every so often, someone is killed or injured in a fall from the bluff. Officials have batted around ideas to turn the area into parkland for 90 years. For now, a wrought iron fence acts as a nominal deterrent to trespassers. But that's introduced its own dangers. Last spring, a woman impaled her leg trying to climb over it.